- Iker Basterrika: Leire: formas, usos y etimología de un topónimo / Leire: forms, uses and etymology of a place-name. 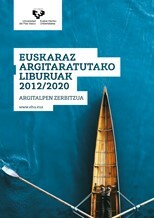 - Endika Blanco: Euskal lexikoaren historiarako: ikerketak Euskara Arkaikoan / Towards a history of the Basque lexicon: studies on Archaic Basque. - Eneko Zuloaga: Diego Lorenzo Urkizuren 1740ko zortzikoak / A critical edition of Diego Lorenzo Urkizu’s verses (1740). - Urtzi Reguero Ugarte: Goizuetako 1753ko sermoia: edizioa eta azterketa / The Goizueta sermon of 1753: edition and analysis. - Oihana Lujanbio Begiristain: Goizuetako azentu-hiztegia / An accent dictionary of Goizueta Basque. - Carolina González: A Typology of Stress- and Foot-Sensitive Consonantal Phenomena. - Beatriz Fernández: -(K)i hiztegian, eta hiztegiaz harantzago / The suffix -ki in the lexicon and beyond. - Ager Gondra: Cross-generational syntactic variation in Mundaka Basque: the influence of the language of instruction. - Ander Egurtzegi: Ekialdeko /o/-ren igoeraren testuinguru fonologikoaren bila / Looking for the phonological context of /o/-raising in Eastern Basque. - Lobke Aelbrecht: Ellipsis in negative fragment answers. - Irina Agafonova: On category restrictions in across-the-board and parasitic domains: evidence from Russian. - Young-ran An: The gradient OCP: evidence from Korean reduplication. - Alexander Andrason: A non-unidirectional movement in the verbal system? - Irene Barberia: Vowel quality effects on hiatus resolution in Spanish. - Rebeka Campos-Astorkiza: Lengthening and prosody in Tuscan Italian. - Naiara Centeno: Determiner sharing in Spanish: DET & DETFoc. - Iñigo Ruiz Arzalluz y Enara San Juan Manso, Un inédito de Orixe: El contenido espiritual de la España nacionalista (1938). - Eneko Zuloaga, Bizkaiko jauntxoen inguruko herri-literaturaz: Plentziako 1603ko hiru esaera zahar eta Refranes y sentenciasen jatorria, eta proposamen bat Arrasateko erreketaren kantuez. - Koldo Ulibarri, Euskal testu corpusa osatzen: J.P. Ulibarriren Egunare eusquerazcoa erderascotic itzuliya. - Patxi Salaberri and Iker Salaberri, Basque legacy in the New World: on the surnames of Latin American presidents. - Urtzi Reguero Ugarte, Erdi Aroko euskararen corpusa osatzeko ekarpena. - Ander Egurtzegi: Euskal metatesiak: abiaburua haien ikerketarako. - Mirari Jurado Noriega: Caracterización de sibilantes fricativas vascas y su percepción en el sistema fonético español. - Oxel Uribe-Etxebarria Lete: Gatzagako Cristau-doctrinia (1862): edizioa. - Natalia M. Zaïka: La réception des contes basques au fil du temps. - Eneko Zuloaga: Nerbioi ibarreko euskara XVIII eta XIX. mendeetan: II. Juan Ignazio Astigarragaren sermoi-bilduma. - Aiora Jaka: Réflexion sur la traduction dans les oeuvres de Joseba Sarrionandia.